There is no ideal travel policy – it needs to be corrected almost every day, and you cannot avoid this process, is the opinion of Maria Sergeeva, head of global business travel department of Luxoft. The expert spoke about the main principles you have to follow when you work out this document, at ABT-ACTE Russia session on February 14. The event was held in the Metropol. Event partners were Lufthansa Group, Etihad Airways, i`way, Mövenpick Hotels & Resorts, HRG Russia, Conference Rent. Business trip arrangement is a process that involves absolutely different experts. All of them have their own goals and targets, their understanding of what a travel policy is. “An ideal travel policy for the traveller is its absence, as a matter of fact: “I want what I want, because I work a lot”, for an HR department it is a story how to make a business trip order in the shortest time possible. Top management is interested in efficient management of this process and cost cutting, of course. Moreover, it does not matter how much money you spent before, they need geometric saving”, Maria said. The travel expert is at the crossroads of all these wishes. He or she has to take into account the requests of all the parties and to spell them out in the document. The way regulations are presented in the travel policy depends on the company – everyone has it his own way. Nevertheless, in any case its main goal should be the unification of booking and approval processes, determination of responsibility areas, budgets and limits at the stage of business trip arrangement, communication between the HR and the financial department. In western companies, a travel policy is never more than 5-6 pages long, the expert noted. In Russian companies it is a document of more than 20 pages of small print describing the ways business trip permits are filled in, administrative orders are formed, issues concerning reports on travel expenses are reconciled with the accounting department. “A document, no one wants to hear about and no one is interested in”, Maria regrets to say. What is must have in the travel policy? A detailed description of the booking process and approval stages, the amount of services included into travel support, including a flight, accommodation, car rental (a transfer, a taxi), limits for all the services, ways of payment. A brief description is enough to provide information on daily travel allowance, mobile communication, HR support, reports, insurance – there are special departments that deal with all this. “You should never combine HR, financial and operational activities in the travel policy, otherwise the document will be very big, hard to read and will not give you the understanding of the way the business trip arrangement process really works”, the speaker is convinced. In fact, you will get back exactly what you write: “A travel policy is your support of yourself”. You should also limit the amount of travel services, and the most important of them are accommodation and a flight. You should remember about special terms for top managers as well: their flight class and hotel level are likely to be higher than those of frontline employees. As for business trip coordination, there should be not more than two approval stages, Maria is convinced. Otherwise, this process will take too much time. “A travel program is a success if its adoption rate is about 80%”, the expert added. “The provisions with the adoption rate below 50% need to be revised, they do not work. Those having a 50% rate and higher still have new challenges ahead”. If the corporate client has TMC support, all the rules of his travel policy can be presented as reason codes: a certain reason code is assigned to each action within or outside the travel policy. The agency can provide such data to the customer in the online mode. “You will see to what extent the employees observe the travel policy. This is the very moment when the text is transferred into quality”, Maria drew session participants` attention to this fact. The problem is to avoid receiving negative feedback every day. And it is bound to be, because there are as many opinions as people, the speaker warned the audience. “An employee on a business trip knows more about travel than we do, it is not up for debate. And our task is to learn to communicate with him, this is why it is so important to spell out all the booking rules and limits in the most “comfortable” way for him”, Maria summed up. Then the session participants started working in groups. An expert was assigned to each of five groups, and he moved to another table in 25 minutes. The participants could address all the questions they had to commercial representative of Lufthansa Group in Russia Valentina Kuznetsova. Valentina said that the company offered an opportunity to arrange any flight, because it is an alliance of air carriers connecting a large number of cities. Thus, you can depart with Lufthansa and return with SWISS. The expert dwelled in more detail on PartnerPlusBenefit, a bonus program offered by Lufthansa to corporate buyers. Buyers get bonus points on their account for every business trip, and the points, in turn, can be exchanged for various privileges. “If you are a member of frequent flyer program as well, you will also get miles in the Miles & More program”, Valentina noted. 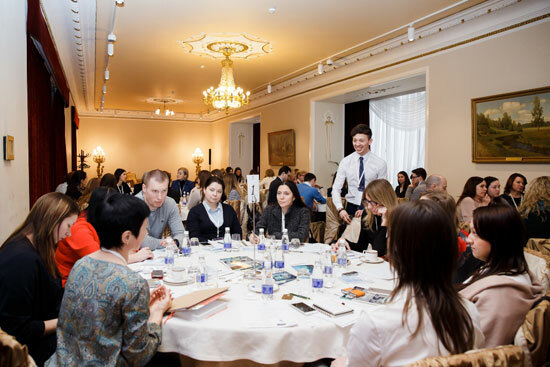 Then Daria Mironova, senior sales manager Russia and CIS of Mövenpick Hotels & Resorts took up the baton. She told the audience about the advantages of corporate accommodation contracts. As a rule, a corporate agreement with a global operator is concluded through its representative, i.e. there is one person to communicate with on all the issues, which is very convenient, the speaker noted. Besides, one contract may include several destinations and hotels at a time. No doubt, this is the way travel budget economy can be achieved: corporate rates are usually 30% lower than the rack rate. “Moreover, they can be loaded into the booking system of your agency or into your client area on the website of the hotel chain”, Daria added. “Consequently, the booking process will be very convenient”. As a rule, you can contemplate a corporate accommodation agreement, if you have a certain amount of nights, usually 50 per year. “It is not much, in fact – only 4-5 nights per month”, the speaker cited the figures. “And in case a new hotel is opened, the annual threshold may be decreased even more - to 30 nights per year”. It is important to find out during the negotiation, whether business travel is subject to seasonal fluctuations, whether the room rate shall include breakfast or not. “It is advisable to request two room categories”, Daria said. “We recommend standard and superior rooms”. Agree on rate type. Hotels offer two categories - LRA (Last Room Rate Availability, the rate the hotel is to confirm regardless of its occupancy rate and other circumstances) and NLRA (Non Last Room Rate Availability, the rate offered to the customer for a certain room category, but the hotel can stop sales under this rate for some periods, even if there are free rooms). Blackout dates are usually spelled out in the contract. At the end of her speech, Daria drew the participants` attention to online platforms used to send RFPs to hotels, in particular, to Lanyon: 99% of all the large hotel chains are registered there. The user, a company or an agency representative, chooses all the parameters he considers important (hotel category, the limit and so on), and the platform makes a short list of the most suitable hotels. “Here you can exchange messages with hotels, discuss cooperation terms”, the expert said. “In Europe you can conclude an agreement online, both parties affix their electronic signatures, which is enough. Unfortunately, in Russia it is impossible due to legislative restrictions”. Anna Kolesnikova, sales and marketing manager of HRG Russia dwelled in more detail on the reason codes mentioned by Maria Sergeeva earlier. “It goes about standard reason codes that are used by agencies in order to analyze your employees` behaviour”, Anna explained. For example, HE (No preferred hotel in the city), HS (Preferred Hotel sold out), PC (Declined lower fare due to Traveller Preferred Carrier) and others. For example, according to the travel policy the employee is to choose the lowest rate when he books a flight, but he chooses another rate. In this case TMC consultant should ask what the reason for the “wrong” choice was. And this reason code will be included into the report. “When you receive such consolidated reports from the agency for a month, a quarter or a year, you begin to understand what travel policy infringement was caused by and to what extent you can control it – there are situations when the wrong choice is a reasonable necessity. Of course, you have the full right to show the company`s will and to introduce restrictions on it”, Anna said. Reason codes bring out weaknesses in the travel policy, the provisions that need to be optimized or revised. “I had a situation when according to the travel policy the employees were to choose the lowest rate within two hours of the time needed”, the speaker said. “And the employees did not choose the lowest rate available in this time range quite often: it seemed to them that the difference of one thousand rubles did not play an important role, and as they chose economy class, everything was okay. In practice, only 50% of business travellers really booked the flight at the lowest rate available… The employees just did not have the full understanding of the travel policy”. The next expert, the commercial representative of a transportation company in Moscow and Saint Petersburg Sergey Fedoreev spoke about the opportunities offered by i`way to corporate buyers. The service is available in 500 airports all over the world. The company is ready to serve the customer both through a travel agency and personally. The order cay be made online or by e-mail. The service desk is available round the clock in Russian, English and Chinese. After the order is made, a voucher is sent to the customer`s email, and two hours before the flight the client receives a message with the driver`s mobile phone and his car number. 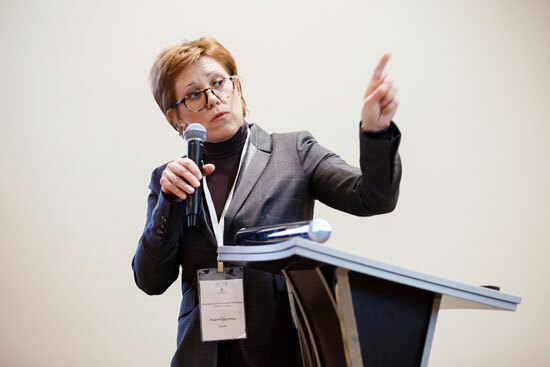 Elizaveta Grigorieva, head of business travel of Lanit Group spoke about the functions of the travel policy once more. “This document gives us an opportunity to manage business travel costs”, Elizaveta noted. “We exercise control in the final point, i.e. following the results of a certain period of time, determine the main destinations, an average accommodation and flight cost, etc. In the point of fact, we do benchmarking. But the money has already been spent, you cannot get it back. The doughnut has been eaten! So, the travel policy is a tool that lets us manage everything in process”. Travel policies of many companies, even those of large corporations have a large amount of text, obtuse phrases, tensile formulations, the expert complained. “Besides, companies often confuse two different documents – an internal regulation describing business processes – the way you should book, who you should get an approval from, and the travel policy itself”. In small companies, the documents are often combined, but in the large ones the regulations may differ in various departments, so it is not advisable to combine them. The speaker also drew the participants` attention to idle threats companies use against colleagues infringing travel policy provisions: “Suppose, if the employee does not book his business trip a week in advance, he is not going anywhere. Are you serious? !” If you set a penalty for the infringement of regulations, it should be executable, Elizaveta stressed. Then the session was over. The organizers thanked everyone for participation and announced the next events. Quite soon, on February 28, an evening cocktail devoted to Morocco and Jordan will be held. IMG Show Russia conference is to be held on October 25-26 this year.